The next meeting is on Friday Nov 8th starting at 7 PM. Usual finish time is by 9 PM The meeting is a few days later than usual so we will be focusing more on the Moon than usual. All are welcome, please remember to dip lights on arrival. If you are intending on viewing it alone please take adequate precautions - especially if you will be pointing cameras with telescopic lenses at the sun. Remember the eclipse is here briefly for a few minutes whereas you want to use your eyes for life. 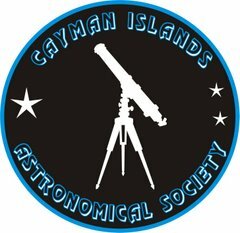 The next Public meeting of the Astronomical Society to be held at Pedros Castle will be on Tuesday the 8th of October starting at 7:00 PM. All are Welcome Remember the meetings will be canceled if sky cover is more than 50 percent or if it is raining. If in doubt phone me on 925 7657 If you come to the site please dip headlights on arrival. We are also involved in two other major events this month. At the UCCI college the Society is involved with the STEM Conference which runs from Wednesday 16th to Saturday the 19th. In particular there are two free events for the General Public. On the evening of Friday 18th there is a lunar eclipse and the UCCI Observatory and the CIAS plan to observe from the UCCI Quadrangle. The Society will be there from 6 PM onwards, with the Moon rising above the buildings in eclipse at perhaps around 7:00 PM. By 8:50 the Eclipse is over. On Saturday afternoon the 19th October there is a family fun afternoon, which again includes the UCCI Observatory and the CIAS to observe the Sun. This will run from 2:30 till 4:30 PM. Other events that afternoon invove a display of robotics, music by a theramin, a Van De Graff Generator (with a teacher attached to it), an alchemist and a rubins tube. Towards the end of this month Comet ISON may become visible in the morning sky. More information on this and other events this month is in the Society newsletter which is availble free to all members. To join please come to our next meeting or email me with your interest.